← 6 of April: Remembering war in Sarajevo. I am in Kozarac now, a place in the municipality of Prijedor in North-west Bosnia which was razed to the ground in May 1992, and the totality of its non-Serb population deported, imprisoned or killed. I went today for a commemoration at one of the concentration camps set up at the time to ‘receive’ the non-Serb population of this area, Trnopolje. There I could see in people’s faces the pain. i’ve seen that pain elsewhere in Bosnia, but today it struck me more than it usually does, I don’t know why. But then I came back to Kozarac and got the news. Tears in everyone’s eyes, not so much of joy, but of surprise…a feeling of disbelief, that a moment in which nobody believed has come. We turn on the tv, and there is Boris Tadic, President of Serbia, confirming the arrest live, first in Serbian, then in English. There, it’s truth! Now we can believe it. We feel happy, my friend and I, both outsiders, both foreigners. We feel happy and excited, but our excitement is shared by the people here only for a brief moment. After the initial disbelief, then the joy that came with the confirmation of the news, the people of Kozarac simply got on with their lives as they do everyday. As if none of this was actually real. The contrast with the frenzy this arrest is causing in the media, on Facebook, on Twitter, could not be more striking. The contrast is such that I get confused. What is the real world, what is the virtual world, why do I seem more excited about this than these people who were once deported, whose homes were destroyed, their family members and friends killed, or themselves mistreated, abused, who knows what each of them went through… My excitement went away now. What does it mean, this quietude? It means at the very least that the arrest of one of the major responsibles for the tragedy that befell on Bosnia 19 years ago is not a matter for rejoicing. What is there to expect then? I am told meanwhile that the same reaction was observed here when Karadzic was arrested. What is there to expect? The facts about what happened in the municipality of Prijedor 19 years ago are clear enough. The ICTY and the war crimes chamber in the State court in Sarajevo have produced enough convictions for people not to have many illusions about the benefits of justice in their lives. This is not to mean that justice is not important. It is, for every single person I spoke to in this community. That is why many of them made the sacrifice of witnessing at the different courts, thus offering their contribution to the discovery of the truth. But still, despite everything that everybody knows, since in August 6th 1992 Ed Vulliamy, Penny Marshall and Ian Williams came here and the whole world heard for the first time this almost unpronounceable word, Trnopolje, Tr-no-po-lje (yes even now, 6 years after I started to learn this language once known as serbo-croatian and which I now call Bosnian, I still find it hard to pronounce it, and cannot avoid putting the accent on the wrong syllable)… despite what we all saw then, despite the UN Prijedor Report, despite the convictions at the Hague and in Sarajevo, despite the ITN versus LM libel case in the UK, despite all of this, despite the fact that the truth is established and accessible, there isn’t even a memorial plaque in Trnopolje acknowledging that non-Serbs were imprisoned there, mistreated there, raped there, and then all of those who were not killed there were sent other camps, or to exile. 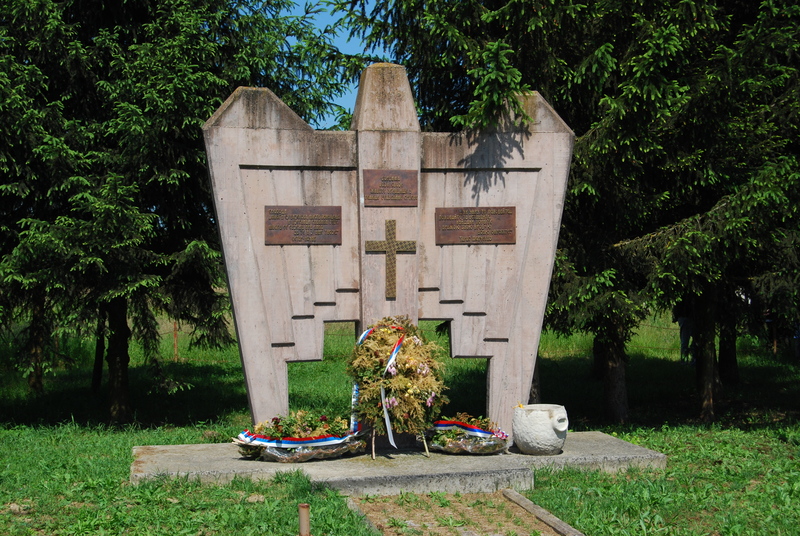 In this place, where a school was turned into a concentration camp and then once again into a school, there is, however, a monument to the fallen soldiers of Trnopolje. Yes, a memorial to Mladic’s soldiers stands there, through which the children pass everyday on their way to school. It goes without saying that this monument is a serious obstacle to reconciliation in this region. So, in the end, maybe this is one of the reasons why there is no more than a quiet satisfaction here in Kozarac, this place that stands as a rare example of success on the minority return movement. Whatever justice could promise them, it has already been delivered. Now it is up to politics to do the rest. It is for political responsibles to acknowledge the truth that justice has already revealed, and in Prijedor that is a long way from happening. This is is clear not only through the case of the logor Trnopolje, but also through the case of the concentration camp of Omarska. which was set up on a complex of buildings belonging to an iron mining company, which was reverted to its prior use after the war ended and is now property of the greatest multinational of steel and iron, Mittal Arcelor. And this leads us to the political impact of this arrest. But that will wait for another post. It was your destiny to be there and to share with us your experience! May 24-26,1992 were the darkest days for the people of Kozarac. Our lives were destroyed and many of our loved ones killed in ways that there are no words to describe it. I have to say that we have waited for too long for Mladic to be arrested and for it to happen during the commemoration – speechless! I hope that his trial will enable Bosnia to start the process of reconciliation and that justice will prevail without it being manipulated or politicized! I have to stay I am lost for words because I never thought this moment would come. I really hope him and Karadzic will have a trial that is not a circus, and I hope they live to see justice done, unlike in the case of Slobodan Milosevic. The whole region needs this – for Bosnia, the countless victims need at least this symbolic gesture, while Serbia desperately needs to jettison it’s murky recent past. Today is the day after the anniversary of the Kapija massacre in Tuzla. Finally, finally, finally. Amila, one and one make two. I think they realise that there is a long road ahead. Trials are traumatic for the victims as testimony must be borne and wounds reopened to show to the world what happened and why these people must be convicted. The rest of the world having the online frenzy will soon forget about Mladic and most likely not follow the trial. Tomorrow the Dutch Appeal Court announces its decision on the appeal by Hasan Nuhanovic and the Mustafic family against the District Court decision that the Netherlands wasn’t responsible for failing to protect their relatives when Dutchbat ordered them to leave the base at Potocari and handed them over to Mladic for execution. The District Court decided that effective command and control of Dutchbat had passed from the Dutch to the UN. Hasan Nuhanovic and the Mustafics maintain that the Dutch were sidestepping the UN chain of command. At 10 a.m. on 5 July 2011 the Dutch Appeal Court will deliver its judgment on the appeal filed by Bosnian survivors of the Srebrenica genocide against a District Court ruling that the Netherlands did not fail in its duty of care to their relatives when they were handed over for execution by the Bosnian Serb Army forces commanded by General Ratko Mladic. Hasan Nuhanovic, a United Nations interpreter who lost his father, mother and younger brother, and Mehida, Alma and Damir Mustafic, wife, daughter and son of an employee of the United Nations Protection Force, hold the Dutch state responsible for the failure of Dutch troops acting under a UN mandate to protect their family members murdered in July 1995. They are challenging an initial finding by the District Court in The Hague that the United Nations was in effective command and control of the Dutch Battalion (“Dutchbat”) and responsible for the fate of refugees offered protection on the UN base at Potocari when the so-called UN “safe area” fell to the Bosnian Serb Army. Dutch soldiers wearing U.N. blue helmets ordered Ibro, Nasiha and Muhamed Nuhanovic and Rizo Mustafic to leave the safety of the base where they were sheltering and watched on as women and young girls were taken away and raped and men and boys were separated from their families before being taken away for execution. Hasan Nuhanovic and the Mustafic family allege that the Dutch government was responsible for the actions of the Dutchbat contingent. The plaintiffs’ lawyer, the international humanitarian law specialist Liesbeth Zegveld, argues that the Dutch government and the Dutch command within UNPROFOR were aware of the probable fate of the civilians they were handing over to General Mladic but were primarily concerned for the welfare of their own mission. The District Court decided that Dutchbat were acting under the “command and control” of the United Nations, which claims absolute immunity from legal action. The plaintiffs in the civil action argue that evidence shows that the Dutch took decisions outside the United Nations chain of command. Ratko Mladic, commander of the Bosnian Serb forces, is currently facing trial before the International Criminal Tribunal for the Former Yugoslavia on war crimes charges including genocide at Srebrenica. Prof. Dr. Liesbeth Zegveld is a partner at Böhler Advocaten, Attorneys, where she is a member of the international law & human rights department. She is professor of International Humanitarian Law, in particular the Rights of Women and Children, at Leiden University. Hasan Nuhanovic campaigns for truth and justice for the victims and survivors of genocide at Srebrenica and now lives in Sarajevo. Amsterdam / Sarajevo, 1. srpnja 2011. Holandski Apelacioni sud će 5. srpnja 2011. donijeti presudu na žalbu koju su preživjele žrtve genocida u Srebrenici uložile protiv presude Okružnog suda da Holandija nije povrijedila obavezu da zaštiti njihove bližnje time što ih je predala snagama Vojske bosanskih Srba pod zapovjedništvom generala Ratka Mladića i tako ih gurnula u sigurnu smrt. Hasan Nuhanović, prevodilac Ujedinjenih naroda, koji je u masakru izgubio oca, majku i mladjeg brata, te porodica Rize Mustafića (Mehida, Alma i Damir Mustafić, supruga, kći i sin) koji je bio zaposlen kod holandskog bataljona Zaštitnih trupa Ujedinjenih naroda (United Nations Protection Force, UNPROFOR), tvrde da je holandska Vlada odgovorna za neuspjeh holandskih snaga koje su djelovale pod mandatom UN-a kako bi zaštitile članove njihove obitelji ubijene u srpnju 1995. Oni su uložili žalbu na prvu presudu Okružnog suda u Den Haagu, prema kojoj su Ujedinjeni narodi imali isključivo zapovjedništvo i kontrolu nad nizozemskim bataljonom (“Dutchbat”) i time bili odgovorni za sudbinu izbjeglica kojima je ponudjena zaštita u bazi UN-a u Potočarima, kada je tzv. “zaštićena zonu” UN-a pala u ruke Vojske bosanskih Srba (VRS). Nizozemski “plavi šljemovi” naredili su Ibri, Nasihi i Muhamedu Nuhanoviću te Rizi Mustafiću da napuste bazu UNPROFOR-a u kojoj su bili našli utočište. Vojnicima holandskih plavih šljemova stavlja se na teret da su skrštenih ruku promatrali kada su žene i mlade djevojke odvodjene i silovane, a muškarci i mladići selektirani i kasnije masovno poubijani. Hasan Nuhanović i obitelj Mustafić tvrde da je holandska Vlada odgovorna za djelovanje bataljona Dutchbat. Odvjetnica tužitelja i ekspert medjunarodnog humanitarnog prava Liesbeth Zegveld tvrdi da su holandska Vlada i Komanda holandskog bataljona u sklopu UNPROFOR-a bili vjerojatno svjesni sudbine civila kada su ih predavali generalu Mladiću, ali su se u prvoj liniji brinule za sigurnost svojih vojnika, a ne za sigurnost civilnog stanovništva zbog čije zaštite su tamo bile stacionirane. Okružni sud je zaključio da je Dutchbat djelovao pod “komandom i kontrolom” Ujedinjenih naroda koje imaju apsolutni imunitet na teritoriji svake drzave. Tužitelji u civilnom postupku tvrde da dokazi pokazuju da su holandske trupe donosile odluke izvan lanca zapovijedanja Ujedinjenih naroda. Ratko Mladić, zapovjednik vojnih snaga bosanskih Srba, trenutno se nalazi pred Medjunarodnim kaznenim sudom za bivšu Jugoslaviju, koji ga tereti za za ratne zločine, uključujući genocid u Srebrenici. Dr. Liesbeth Zegveld je partner u odvjetnickoj kancelariji Böhler Advocaten, Attorneys. Clan je Odjela za medjunarodno pravo i ljudska prava. Ona je profesor medjunarodnog humanitarnog prava i ekspert za prava žena i djece, na Sveučilištu Leiden, Nizozemska. Sorry, Sarah, double copy of the Bosnian posted. “The ruling said even though the Dutch soldiers were operating under a U.N mandate, they were under the “effective control” of top Dutch military and government officials in The Hague when they ordered hundreds of Muslim men and boys out of their compound. The ruling said the three men [Ibro and Muhamed Nuhanovic, Rizo Mustafic] were among the last to be expelled and by that time the “Dutchbat” peacekeepers already had seen Bosnian Serb troops abusing Muslim men and boys and should have known they faced the real threat of being killed. Comments are welcomed in this blog. However, hate speech and ad hominen attacks will be systematically erased. Nurturing freedom of expression does not include tolerating intolerance. Extremists and self-isolation: the case of the daily rallies in Trg Republike, Belgrade. THE SARAJEVO PROTESTS: my eyewitness account. The old man and the cats of Korcula. WALKING BACK TO SREBRENICA: the March for Peace and the memory of genocide in Bosnia. Plataforma por las victimas de desapariciones forzadas del franquismo.